This is real cause for celebration because I was at the LQS and spent several hours for the sew in yesterday. I had two gift certificates for a total of $25. That means there was nothing holding me back from buying fabric. It wasn’t the selection because there were a ton that I loved and I could easily have bought them. What really held me back was that I am trying to use my stash and I have no need for new fabric. I want to eventually get to the point where I’m buying fabric for projects I’m working on. I will not get to that point if I keep buying fabric without having a project in mind for them. In addition, I know that I will need to get backing for Celtic Solstice at some point. I know I’ve already got backing for all the quilts ready for quilting as well as Hampton Ridge so Celtic Solstice will be the next quilt that I will finish and be needing a back for. I just didn’t know how much I needed and didn’t feel the urge to get it while I’m nowhere near to finishing. Which meant that I wasn’t ready to buy the backing. At the end of the day, I’m keeping my gift certificates for the next really great sale when I can buy 10 yards for backing. On another note, I had a great time at the sew in. I met 4 new ladies and we chatted and had a great time. I’m looking forward to the next sew in. I also got step 5 of Celtic Solstice finished and started working on step 6. 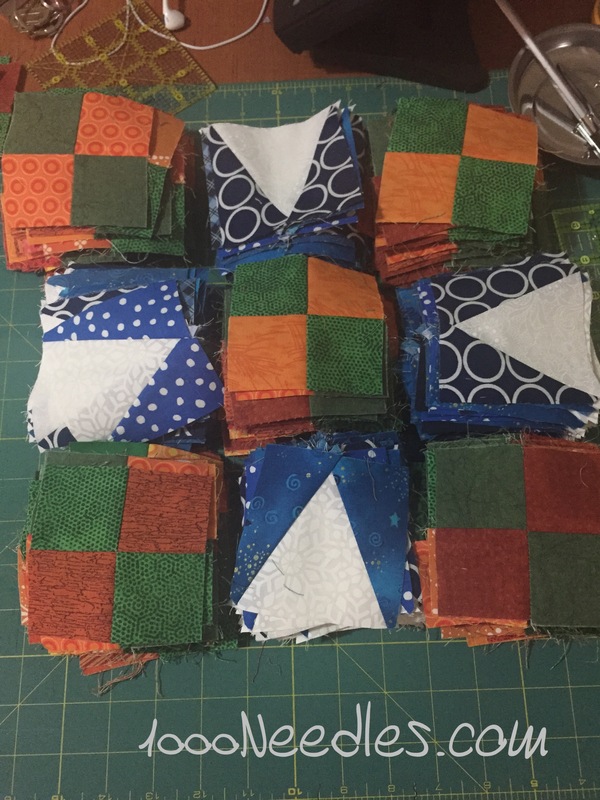 I need to make over 50 of this block. I know I said yesterday that I was going to take a break and start working on something else. But, I got my mojo back for Celtic Solstice. I think I’ll ride this wave and next time I feel like I’m bored or tired of this project, I’ll move to something else. The blocks are forming together and this is the best part! Here are all the blocks laid out and ready for me to chain piece! 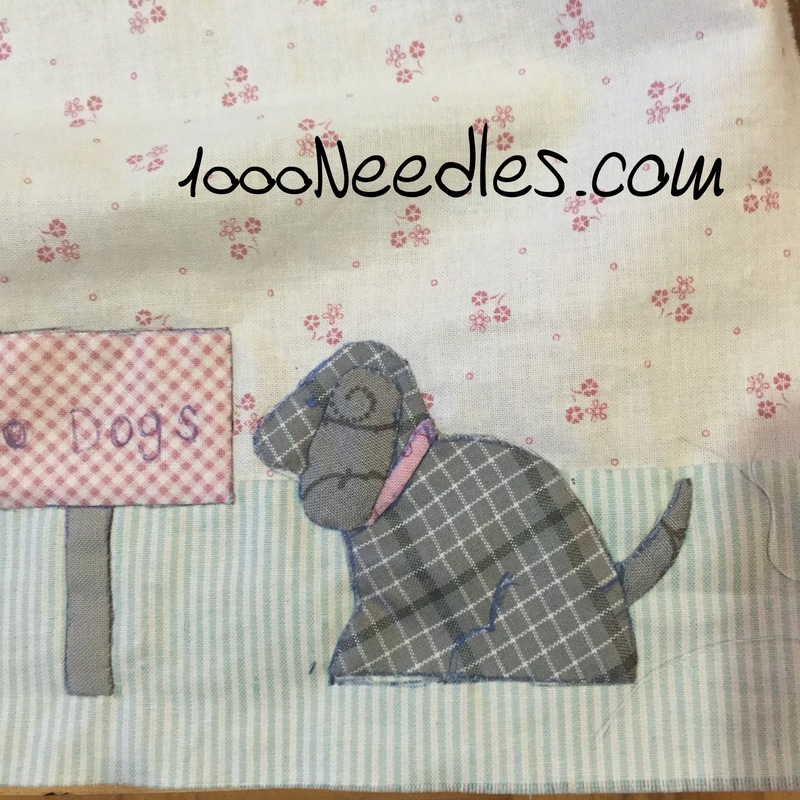 Last week I was able to applique the ear on the dog for Raining Cats and Dogs – so the next step is to mark up the next section that needs to be appliqued. I will not have time to actually do any appliqueing but I want to get the marks up and if I’m feeling it, prep the first piece for next time. When the motivation is there, there gotta sew sew sew! Happy that little puppy has it’s ear! Love the dog. 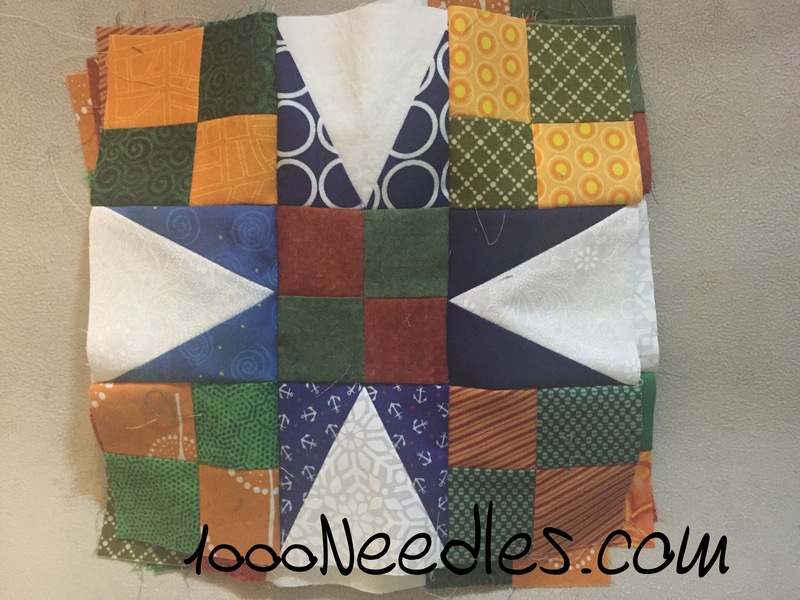 I agree, go with it while you are feeling like it – but I would say quit while you still want to keep sewing, so you will want to come back to it again! I think all the step 5 was just getting boring, whereas seeing blocks come together is exciting. I love your star blocks — did you use the tri recs ruler? Celtic Solstice is looking good !